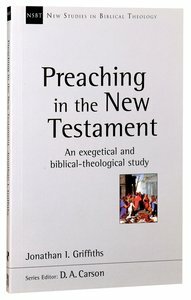 About "An Preaching in the New Testament: Exegetical and Biblical-Theological Study (New Studies In Biblical Theology Series)"
Jonathan Griffiths is the Lead Pastor of the Metropolitan Bible Church, Ottawa, Canada. He previously served as an instructor on the Cornhill Training Course at the Proclamation Trust, London, and before that as assistant minister at Christ Church, Westbourne. Jonathan holds a PhD from the University of Cambridge. He is married to Gemma and they have two children, Edward and Arabella. Customer Reviews For "An Preaching in the New Testament: Exegetical and Biblical-Theological Study (New Studies In Biblical Theology Series)"
The definition of prayer that underpins this study is simple - "calling on the name of the Lord". From this starting point, Gary Millar carefully traces the contours of prayer in both testaments, showing that it is all about calling God to deliver on the covenant promises he has made. From this first mention of prayer in the Bible, right through to the end, when the church prays Come, Lord Jesus! (Revelation 22:20), prayer is intimately linked with the gospel - God's promised and provided solution to the problem of human rebellion against him and its consequences. After defining prayer simply as calling on the name of the Lord, Gary Millar follows the contours of the Bible's teaching on prayer. His conviction is that even careful readers can often overlook significant material because it is deeply embedded in narrative or poetic passages where the main emphases lie elsewhere. Millar's initial focus is on how calling on the name of the Lord to deliver on his covenantal promises is the foundation for all that the Old Testament says about prayer. Moving to the New Testament, he shows how this is redefined by Jesus himself, and how, after his death and resurrection, the apostles understood praying in the name of Jesus to be the equivalent new covenant expression. Throughout the Bible, prayer is to be primarily understood as asking God to deliver on what he has already promised as Calvin expressed it, through the gospel our hearts are trained to call on God's name (Institutes 3.20.1).